Historically, Cayman had a shark fishery targeting sharks mainly for their skin. The heavy fishing pressure caused our shark populations to collapse fairly quickly and the fishery ceased. To gather baseline information, the shark research team began working on Cayman’s sharks in 2009. Through our work, sharks are now protected under the National Conservation Law in Cayman waters since 2015. Sharks are still not common in Cayman and it will take some time for the protection measures to be reflected on local shark population numbers. Through a range of complementary methods, we monitor our sharks and study their behaviour to better conserve them for the future of our coral reefs and marine ecosystems. It takes teamwork, time and funding to delve into these solitary animals’ lives to understand their needs, habits and lifestyle. 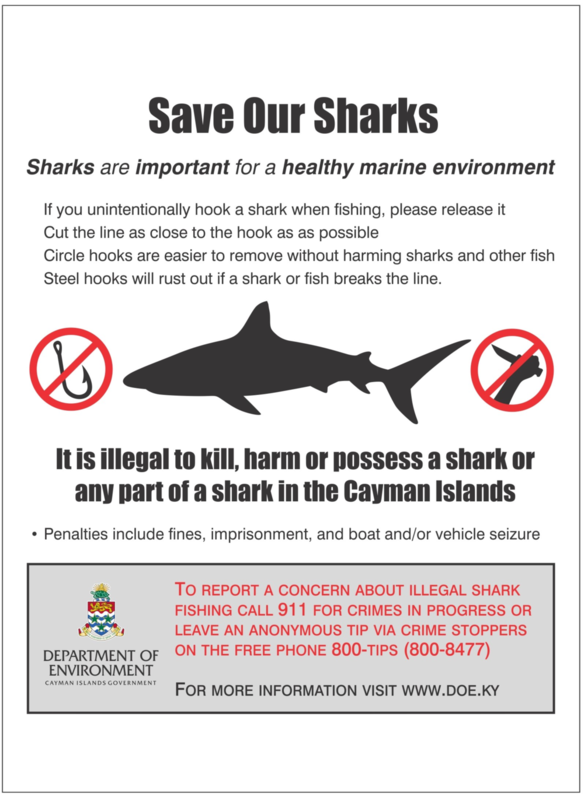 Shark signs at boat ramps and public docks are reminding the public that sharks are protected in Cayman.